Updated, 2:41 p.m.: Minor revision. Mall developer GGP says it has a big problem. In June 2016, GGP won permission to build a mall and hotel in Norwalk, on the County’s most desirable parcel of open land. GGP’s preference at the time was to build a mall without a hotel, but Norwalk’s leaders insisted on the hotel as a condition of approval, believing that a mixed-use project was far better for the city. GGP added the hotel, obtained their approvals, and recently announced that they can’t build the promised hotel because it is “economically unfeasible” for them. Now GGP wants special permission to revise its plans to omit the hotel. Norwalk’s leaders already compromised tremendously to grant the June 2016 approval. Therefore, any further compromises should require a hard look at GGP’s definition of “unfeasible” economics. To their credit, GGP team members Doug Adams and Larry Cafero were forthcoming at last week’s information session held at their SoNo storefront. Doug was also forthcoming when I contacted him afterwards by phone. Please bear with me for a few sentences worth of numbers — they’re important. GGP expects a return of about 8% on the entire project. The cost to build the mall without a hotel is roughly $475 million, which would achieve GGP’s desired 8% return. Building the hotel costs an extra $56 million, and the projected rate of return on the hotel portion is 4.4%. Using math that I learned in public schools, and GGP’s own figures, I calculate that building the mall plus the hotel would reduce GGP’s rate of return from 8% to 7.63%. What do these rates of return translate to in dollars? At 7.63%, the mall plus hotel would earn $40.5 million per year for GGP. 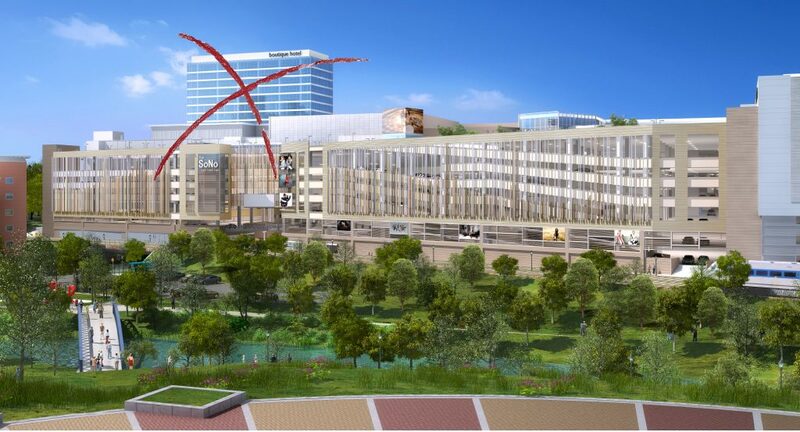 At 8%, the mall plus hotel would earn $42.5 million per year. Therefore, if GGP fulfills its obligation to build a hotel along with the mall, it will be $2 million per year short of their profit target. GGP’s “big problem” is that it doesn’t wish to proceed with building under these conditions. GGP’s elegant solution is a “deal in principle” negotiated with Mayor Harry Rilling, the RDA, and Council leadership to remove the requirement to build a hotel. Norwalk’s Common Council can approve or reject the proposal, and will consider moving it along at their meeting on Tuesday at 7:30 p.m.; if they do, Council would vote again once specifics are ironed out. Under the revised deal, Norwalk would grant GGP permission to omit the hotel, which solves GGP’s alleged $2 million per year shortfall. In exchange, Norwalk will receive a lump sum payment which is the equivalent of $200,000 per year for 17.5 years. Is this a balanced deal, or should Norwalk and GGP split the $2 million yearly benefit to GGP from omitting the hotel? If the Common Council rejects the deal, GGPs says the next step is to pursue arbitration or a lawsuit against the city. I’m of two minds on this deal. As a businessman, I empathize and root for anyone seeking to (ethically) earn a profit by taking risk and creating value for customers. As a citizen, I’m concerned that the city could be outmaneuvered by a savvy developer with an impressive lobbying team. Norwalk did not create the alleged shortfall in GGP’s yearly profits, yet Norwalk is on the verge of handing the developer a concession worth $2 million per year in exchange for a payment that is only 10% of that sum. In other words, the deal is 90% in the developer’s favor. Moreover, under the new deal GGP gains what it wanted in the first place, but couldn’t obtain — namely permission to develop the entire property as a mall only, with no significant mixed use. The deal’s supporters note that once the mall is built, GGP will pay property taxes of $2.5 million per year, which will double after five years. New tax revenue would be welcome, as would the temporary and permanent jobs the mall would bring. This is why Norwalk’s leaders agreed in late 2015 that GGP could substitute a hotel for residential or office space, which would have been more desirable. Norwalk also agreed to count “public realm” space within the mall as a mixed use, even though it’s likely to be a place where shoppers rest their weary feet and enjoy some frozen yogurt. The key point here is that Norwalk already made major concessions to GGP so the mall would be built. Now GGP doesn’t like the deal and wants a new one. GGP’s solution is to pay Norwalk the equivalent of $200,000 per year for changes that appear to benefit the developer to the tune of $2 million per year in perpetuity. Is this reasonable? Check my math with an independent expert and with GGP, and have the expert audit and verify GGP’s numbers. I’m not a real estate analyst and the Common Council should be guided by numbers from an independent person who is. If the numbers are anywhere near what I calculated, reject the deal and invite GGP back to the negotiating table. Stand firm. Norwalk has already made major concessions to GGP. As a condition of revising the LDA yet again, insist that Norwalk gains at least half of GGP’s monetary benefit from doing so. By all appearances, GGP is doing an excellent job of looking out for its shareholders. My hope is that our Common Council will stand up for Norwalk’s 87,000+ shareholders and demand a more balanced deal. Bob Welsh is a Board member of Chapman Hyperlocal Media, Inc., the 501(c)3 nonprofit supporting NancyOnNorwalk. @Bob – thanks for a great recap of the current situation, and for doing the math. Even my cursory review of tax revenue based on the other Norwalk hotels yield a lump sum payout starting at no less than $6.8 million. Indeed, this is a win-win deal, but only for GGP and their stakeholders. Norwalkers will lose once again. To clarify a point or two: I don’t think Norwalk asked for a hotel to be a part of the mixed use, rather GGP offered it up after reviewing a list of acceptable mixed-use components, and in doing so, presumably had the feasibility study to support it. Yes, we know that GGP added a caveat that the hotel may prove to be economically not feasible, which many saw back then as an omen for things to come. Their ludicrous excuses that the profit margins just aren’t there, and that the market will be saturated now due to F.D. Rich building an extended stay suite hotel down the road, are insulting. The profit margins of GGP are not the concern of Norwalk taxpayers, and the Rich hotel project has been approved and on the books since 2009! Before our Common Council votes on this matter, I hope they will have completed their due diligence, which was unlikely in the 5 business days they’ve had to review a 226-page document. As to vetting, I hope at a minimum they demand to see the original economic feasibility studies that suggested a hotel would be viable, and also to see why they are now also pulling their back-up commitment to replace a hotel with office and/or residential! Rilling said the city needs to know what GGP has in mind before the RDA approves the transfer. The math is atrocious, and relies on false assumptions that belie a basic understanding of how revenue and taxes function. Try again, Bob Welsh. What’s really atrocious is the belief that a mall in Norwalk will succeed while malls across the country are failing. @Diane C2 – Thank you for the clarification. @Atrocious – Thanks for reading the piece. Since you seem to have a different view, how about sharing your calculation of the $ benefit to GGP if they receive permission to omit the hotel? @Atrocious – Whatever the actual yearly $ benefit to GGP of the new deal is, I’m willing to bet a slice of pie at Penny’s that it’s a big multiple of the $200,000 per year GGP wishes to pay the city for it. If the Hotel wasn’t a good deal then GGP shouldn’t have signed a deal that included it! This is Bait and switch. The City needs to hold them to the deal as it is or renegotiate the whole thing. If we are renegotiating, how about pulling the tax abatement for Reed-Putnam? Nancy- thank you for your well written articles. I especially like the Comments. PULL THE PLUG ON THIS DEAL!!! It’s been cursed from day one! I attended last week’s info session hosted by GGP, and am also suspicious of the figures they floated for the loss of tax revenue to the city if the hotel is dropped from the project. GGP spokespersons are professional and knowledgeable. They have a game plan, and they’re sticking to it. The CC and mayor should be in the driver’s seat, but they’ve been outmaneuvered by a more sophisticated and smarter “opponent”. I do not believe GGP would invest millions of dollars in start up costs while they await final approvals if they had any intention to walk. The decision to begin groundbreaking in the meantime, ostensibly so they don’t lose one of their anchors, is mostly a sales gimmick to nudge councilmembers in the desired direction of approving the change in the LDA. Bob – well thought out. But there is another set of facts to throw into the equation. This land has lain fallow for two decades and during that time Norwalk lost two promising developments, and countless millions in tax benefits, jobs and follow on economic development. That initial start date of the Fred F. French development sometime in the late 1990’s should be our starting point for a true and accurate fiscal accounting, not as of tonight’s meeting. The LDA itself has changed at least 3 times, if not more, so it’s not like the LDA is carved in stone. Regarding your ROI analysis – it’s good but simplistic as it needs to account for the timing of costs vs. benefits, sources and uses of capital etc. Every dollar expended needs to be compensated accordingly to the terms of whoever provided that dollar. Besides which the mall and hotel P&L’s should be separate and not lumped together. If the returns don’t hit the threshold than the development, or part thereof, does not get done. 4.4% is a long way from 8% – the hotel P&L doesn’t cut it and should be tossed. That’s just good business. Furthermore, I wouldn’t be so confident that Norwalk did not assist in GGP’s “fiscal shortfall”. With two failed developments to date on this property (Fred F. French and Spinnaker), brought about by the glacial pace Norwalk imposes on the developers within RDA’s purview, delaying GGP signals to the marketplace that Capitalization Rates and Discount Rates need to be increased to account for the added risk of dealing with the Norwalk process (higher rates = lower value). This is a complex cash flow and the devil is in the details. I agree with you that Norwalk should have engaged a qualified advisor. The operative words here are “should have”. To engage one now would just add more time to an already delayed project. Finally, I think it’s ironic that this is a “public-private” partnership when the developer paid $35 million for the land. POKO, which “bought” its land on Wall Street for a $1.00 is a true public private partnership, The Collection is not. Insofar as GGP has a reasonable track record of success, allowing them to move forward could be preferable to allowing them to walk. But the city should apply whatever leverage they have in order to make the proposed development pay off for local residents, tax payers and business owners. In another thread, I suggested GGP itself should take the $3.5 million (or 7 million or whatever figure the city settles on) and create a plan of development and revitalization for the SoNo collection neighborhood. If they give the money to the city, it goes into the general fund according to Rilling, and then who knows how and when the money will be spent. But I would not hold my breath waiting for the tin star sheriffs who run this one pony town to actually execute a plan that benefits the entire community. Norwalk doesn’t need any more temporary ice rinks for Darien and New Canaan hockey teams.